Check this page often for all the news and updates from our store and manufacturers we carry. Our site's photo gallery is back online with over 200 photos we took while attending the 2019 German Toyfair in Nuremberg. Toyfair Video coming soon! The following is a brief Model Railway summary of the annual Nuremberg Spielwarmesse or Toyfair held each year in the famous toy city, Nuremberg, Germany. Here manufacturers from all over Europe and Asia gather to display their new product offerings and invite dealers from all over the world to come view and of course place their orders. The event helps factories get an indication of what will be popular and what will not be so popular thereby, giving them the opportunity to adjust their production quotas. This in turn, gives dealers first hand information on assisting them with their Toyfair Orders. In the Model Train Pavilion, many of the manufacturers come with special surprises for dealers, (New Items not announced on the Internet), usually very limited and available only to those in attendance. Please note that when we mention that at an item is 'sold out at the factory' it means that the factory's limited production run has all been allocated to dealers. We have a limited number of these items allocated to us and they can be ordered from our website (while quantities last). Marklin as always dominates the pavilion being the largest and oldest model railway manufacturer in the world. In fact, this year is their 160th Birthday! Happy Birthday Marklin! No doubt, special items will be announced throughout the year celebrating this tremendous achievement. Unfortunately, this year, they we’re unable to provide their usual HO operating layouts for both Marklin/Trix HO and MiniTrix, so no video’s could be offered. They did however have a area set aside for MyWorld and StartUp where operating displays and new products we’re shown. Factories always love anniversaries and this year, Marklin celebrates the Swiss Crocodile Ce 6/8 II 100th year! For this they just had to do something very special and they did just that. A 24 carat Gold Edition with a worldwide limited production to 3,500 units. This is simply not gold plating on the top of the metal, but requires 5 intricate steps where each piece is overlaid internally and externally with 24 carat gold. Of course, it follows they will have exclusive packaging to complement this very special edition. These have been selling very well and are close to selling out as each dealer is limited to a respective allocation. If you are a fan of the SBB Railways and its infamous Crocodile, then this is a must have for your collection. You will find this under stock # 32560. Reserve yours now and avoid disappointment and higher pricing. MHI – Just a quick note that the entire production run of the first 2019 Exclusive Item announcements have been sold out at the factory which means do not wait if their was an item you we’re looking at getting. The MHI Group decided to celebrate the 50 year anniversary with a special Tin-Plate edition of the E44 and 3-car passenger set, stock # 30110 and 41920. In Germany, the famous Tourism train is being offered for the first time with dual Cl 218 Diesels, # 39218/39219 and coach set 43878. The coach set comes with LED lighting, tail-lighting, new tooling for the dining car and electrical conducting couplers as well. Will certainly make for a stunning train on ones layout. The last MHI highlight is the first Insider Edition for 2019, the CL V 320 Diesel, (which is all BRAND NEW TOOLING (an absolute BEAST of a diesel locomotive, # 39320). This will come with 2 car sets, 43385 and 43935. Each coach will have factory installed LED Lighting, figures and electrical conducting couplers. My World – Marklin continues to expand their very successful program for young children from last year’s Airport Express to now the Fire Department Set # 29340 and expansion set # 72219. These sets are fantastic for the 2-4 year old to get started into the fascinating world of model railroading. Fun, educational and very inexpensive, make these an ideal start for your children and/or grandchildren. 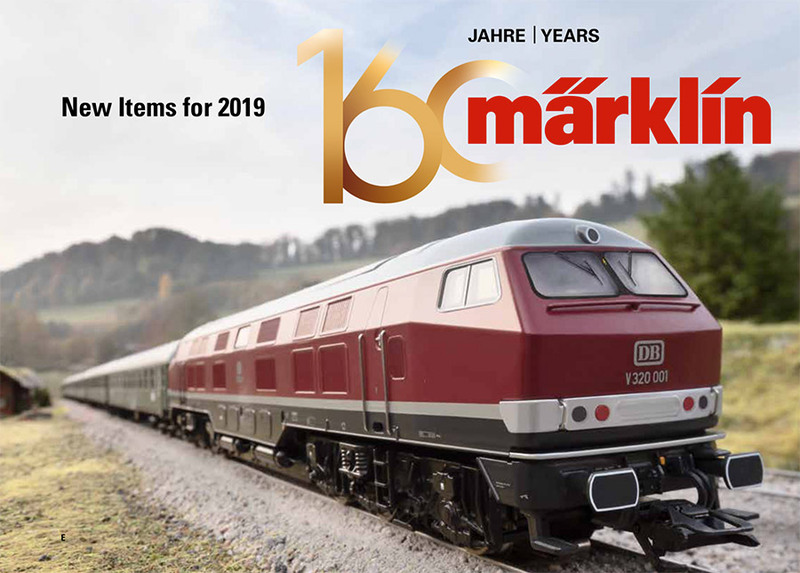 Start-Up – Marklin is offering a Farming Train Set # 29652 and expansion set # 78652. As well, for the first time, a “Building Block” Steam Locomotive starter set # 29730 with an expansion “Disco” wagon # 44738. Children love building blocks and now they can have them moved around with lights and sounds. Just yet another great edition for children 4-8 to play with. Marklin HO NEW TOOLING – Marklin has completely done a remake of the 44 Steam Locomotive with Oil Tender. All metal boiler, chassis. The MFX+ w/Sound version is offered under stock # 39880 and non-sound version # 39882. Respectively, one can order the DC Versions under TRIX, stock # 22981 and 22983. Of course, to make the famous Jumbo 44’s work, one must have fitting freight cars to haul. Marklin offers the ErzIIId 12 Piece Hopper Car set with “Real Iron Ore”, all with different road #’s. You can order this set under stock # 46210 and the Trix version under # 24129. To make the ideal train, order one of each set to make up a 24 car unit which would look stunning on one’s model railway coming around a corner or out of a tunnel. Cl 103.1 TEE Electric Locomotive, stock # 39150 and in Trix # 22933. Again, complete new tooling. These are the “Short Cab” versions with operating double arm pantographs; Cab and Engine room lighting and of course, extensive sound functions. Marklin teased us with the announcement of the ICE 4, Class 412/812 as a 5 piece set; stock # 39714 and in Trix 22971. The set will come with different lighting scenario’s; digitally controlled pantographs; MFX+ w/Extensive sound functions. Additional 3 Piece add-on set # 43724 and a single add-on coach # 43725. These cars are found in Trix, stock # 23971 and 23972 respectively. These are to be released in 2020, hopefully early 2020 so reserve your set now for the lowest price. In celebration of the 100 Year Crocodile Anniversary, Marklin announced another SBB Model Cl Fc 2x3/4 Electric Locomotive “Little Suitcases”, (due to its frontal end appearances). These look as imposing as the SBB Crocodiles do. These are full metal bodies/chassis w/extensive detailing, lighting and sound functions. The Marklin Version can be found under stock # 39520 and in Trix under 22968. Marklin is also offering an appropriate 6 piece car set stock # 46520. Yet another anniversary in Switzerland is the Swiss National Circus Knie celebrating its 100 year Anniversary. Marklin is therefore offering a 4 piece train set with the “KNIE” Circus wagons as loads on stake cars pulled by a SBB Re 4/4 II Electric Locomotive. Stock # 26615. 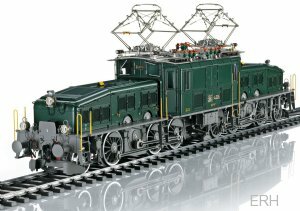 The last HO highlight is Marklin’s new turntable, stock # 74861 with extension sets # 74871. This turntable is also offered under Trix, stock # 66861 and extension set. The Marklin program has been without a turntable for more the 2 years now. This turntable differs dramatically from the previous one in several ways; first, it’s a 23 metre table vs. the former 27 meter one, so, this one is somewhat smaller. Second, the grid spacing is for 12 degrees, allowing for only 30 entrances vs. the former of 48. Oh well, now we can expand to two turntables allowing for 60 locomotives vs. 48 on our layouts 😊. In addition to digital operation with either MFX or DCC, this table comes a Operating Hut w/ 2 digitally controlled lights; 2 different horn blasts and of course, special turntable operational sounds. To protect your locomotives, one needs engine sheds and with a new 12 degree spacing, new engine sheds at that. Marklin is offering laser cut engine sheds under stock # 72886. The kits come with 6 interior LED lights as well as intermediate supports for expanding the sheds. Now for the Toyfair surprises. Marklin is offering the E17 Electric locomotive # 37064 together with a 4 piece coach set, stock # 42228 in the infamous “Steel-Blue” livery. Not a lot of details yet, but the locomotive is MFX+ w/extensive sound features. As always, Toyfair locomotives and related cars are highly sought after by collectors and modellers but are extremely limited. Do not miss out on this year’s model and Reserve yours’s today. Our last Toyfair surprise in HO was the announcement of a very limited special weathered edition of the DRG cl 42 together with a DRG Flat Car w/Brakeman’s Cab and loaded with a pair of wings. You can find these items under Marklin stock # 39047 and 45088. Unfortunately a Trix version was not offered. This run will be extremely limited so please reserve yours very soon. Pricing to follow as soon as we have further details. Finally, this year’s 2019 HO Museum Car (stock # 48119) is celebrating the Porsche factory with a picture of the Porsche 356 on the door entrances. The end door entrances open and enclosed is a model of the Porsche 356 sports car. MHI program – as mentioned, this first edition for 2019 is sold out at the factory so don’t miss out on our allocation. Marklin is doing the CL 86 Tank Locomotive together with the 4 piece hopper ore car set with loads. You can find this under stock # 88962 and 86307 respectively. This year’s most important Z Scale Model is the Brand New Tooling announcement of the Cl 03.10 Steam Locomotive w/covered coal tender for Insider Club Members only, Stock # 88850. So, if your not a club member, simply contact Brenda at www.marklin.com and she will get you set up as a club member. Marklin Z NEW TOOLING – In addition to the 03.10, Marklin introduced #88025 a Class Klv Volkswagen DB Rail Van that actually runs! Its also the first of a new technique called Plastic filled with Metal! Chassis is die cast metal and the body is plastic filled metal. Z Scale SBB Ce 6/8 Crocodile, Special edition for the 100 Year Anniversary delivered in wooden case containing special booklet about the locomotive and builder’s plate. You can find this under stock # 88564. The TEE 75 Roland Train Set consisting of SBB Re 4/4 Electric locomotive and 4 coaches. You can find this under stock # 81593. This year’s 2019 Z Museum Car (stock # 80030) is celebrating the Porsche factory with a picture of the Porsche 356 on the door entrances. In celebration of the 100 Year Crocodile Anniversary, Marklin announced a completely New Tooled Crocodile e 6/8 III in 1 Gauge. Locomotive chassis and body are all of diecast metal with many separately applied brass parts. Besides 32 sound functions, it comes with digitally controlled double arm pantographs and telex uncoupler on the rear and prototype on the front. 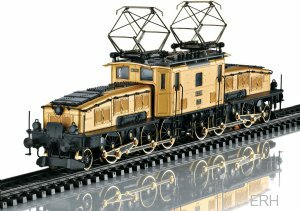 This model is sure to please the most demanding of 1 gauge modellers and collectors. Reserve yours now under stock # 55681. A new water tower of Prussian Standard design is made of finely detailed laser cut with lots of add-on details included. Stock # 56191. A new single track Truss Bridge offered a a detailed Laser Cut kit is offered under stock # 56298. This year’s 2019 1 Museum Car (stock # 58006) is celebrating the Porsche factory with a picture of the Porsche 356 on the door entrances. The end door entrances open and enclosed is a model of the Porsche 356 sports car. MHI – as mentioned, this first MHI edition for 2019 is sold out at the factory so don’t miss out. Class 003 Steam Locomotive DCC/SX w/Sound. This locomotive comes with 27 functions including running gear lights and cab lighting. This locomotive can be ordered under stock # 16031 and the ideal coach set can be found under stock # 15473. This is the famous pop color series with one of the coaches being complete new tooling. The baggage car comes with installed LED marker lights. The Cl 210 Diesel Locomotive is brand new tooling as well found under stock #16210. This locomotive comes with 25 functions including running cab lighting. The 5 piece Munich-Lindau Passenger Car Set is being offered to go with this new diesel. You can find this under stock # 15219. New tooling is also offered for the first time in a 2 piece Postal Car Set under stock # 15540. New tooling is also offered for the first time in a Bicycle Transport Car under stock # 15981. In celebration of the 100 Year Crocodile Anniversary, MiniTrix announced a partially new tooled Crocodile e 6/8 III in N. This locomotive comes with 26 extensive sound functions. This locomotive also makes use of Marklin’s new “Plastic Filled Metal” technology for its body. This locomotive can be ordered under stock # 16681 and is now sold out at the factory. Two new laser cut kits can be found in a new water tower, stock # 66328 and a new Station called Himmelreich, found under stock # 66337. This year’s 2019 N Museum Car (stock # 15569) is 4 axle stake car with a covered wood load by PFLEIDERER. Finally, this year’s Toyfair Locomotive for MiniTrix is the BR 115 DB AG Electric locomotive. This is found under stock # 16107. Many exciting new developments are incorporated in this year’s LGB program. For the first time, synchronized steam exhaust for the wheels. This can be found in the steam locomotive stock # 26844. Another big development is the new radio control handheld unit, stock # 55017 and receiver stock # 55057. We also learned that when used with the Marklin CS2 or 3, one can also use this new RC3 controller for other scales. Last year’s very successful launch of the Jim Button, EMMA Steal Locomotive in Marklin HO, is now to be found in the LGB program under stock # 22222. Very cute locomotive. LGB announces for the first tie the Rhb 6/6 II Electric Locomotive. This is all brand new tooling. Locomotive comes with MFX/DCC Sound and digitally controlled pantographs. A most impressive locomotive that can be ordered under stock # 22061. This year’s LGB Toyfair Locomotive is the Southern Pacific Diesel Locomotive 8448. This locomotive not only comes with MFX/DCC w/extensive sound functions, it also comes completely weathered! This is found under stock # 25558. Finally, this coming May 10, 2019 is the 150 Year Anniversary of the Golden Spike, the day when the Union Pacific met the Central Pacific railway at “Promontory Summit, north of Great Salt Lake. On May 10th, 1869, the Central Pacific’s famous “JUPITER” locomotive met the Union Pacific 119. Now LGB dedicated 4 pages, centre of their new items catalog featuring these iconic locomotives facing each other at their museum in Utah. This can only mean one thing. We believe very Exclusive, Special Edition from LGB of these two locomotives will be announced shortly! Let’s keep our fingers crossed! Stay Tuned for MORE Toyfair Highlights from Roco/Fleischmann, Brawa, and More! Don't forget to check out our Latest Arrivals page for a list of new releases and hot products which recently arrived in our store. See our Product Announcements page for a more complete list of announcements.